Uppada sarees online with best price and highest quality. These uppada pattu sarees are light weight like soft silk sarees and are easy and comfortable to wear. these sarees are made in a small town called uppada, located in andhra pradesh. South India has a one of a kind social and cultural heritage, loaded with assorted and delightful articles of clothing, materials, and designs. There is a solid blend of old, conventional styles and modern, creative feel in this area. The most prominent piece of clothing here (for ladies) is the saree, which is found in various assortments and styles. 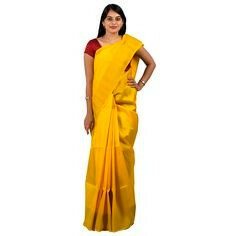 In spite of the fact that there is some measure of stylish shared belief between the different sorts of south Indian sarees, each of them has a novel look which is made by using distinctive sorts of systems of weaving and weaving and Uppada sarees perhaps most loved and liked of sarees waved in south India. Uppada is a village located in the East Godavari district of the Indian state of Andhra Pradesh. The name Jamdani in the Uppada Jamdani Saree is a Persian terminology, in which Jam means flower and Dani means Vase. In 1972, Uppada weavers were recognized by Govt. of India with President's award. Jamdani style of weaving is started in Bangladesh and was brought to the south and in Uppada village of East Godavari district, and weaving recreated with a local character. This brilliant weaving style was as old as 300 years. It takes from 10 to 60 days with at least 2-3 weavers spending 10 hours each to wave Uppada sarees. 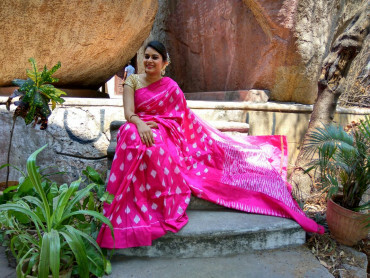 The complete saree is hand-woven and it gets the design on both sides, unlike any other saree. Buy Uppada Pattu sarees and feel the comfort and elegance of a saree well made. Approximately forty percent of the local weavers are women. There are sort of sarees with the cotton body with silk pallu and all completely hand woven. The weavers design in such a way that it can be folded and fit in a matchbox. You can choose from the diverse designs include geometric, flowers, leaves, etc. Uppada Jamdani Saree has turned out to be to a great degree celebrated crosswise over India. Urban areas in this locale, for example, Mysore, are flourishing focuses of silk generation which normally implies that silk is usually used to make various types of saree in this district. These lavish, vigorously embellished assortments, and beautiful and radiant assortments and simpler assortments are all found in the Uppada sarees. The silk utilized is amazingly fine and sourced from the best quality supply of silkworms; alongside this, it is additionally wonderfully woven utilizing handlooms and age-old systems. The Uppada Pattu sarees display the work of South India. The gorgeously looking sarees are the prominent piece of clothing for ladies when draped; nothing looks more beautiful than them. The synonym of sophistication, the sarees have become the women’s favorite clothing to wear on different occasions. In South India, no occasion, wedding or festival is considered as complete without these sarees. They flaunt the old, modern and conventional style in one. Options are not limited as they are available in numerous assortments and styles. Even the modish girls, celebrities and royal ladies are making them as a precious addition to their wardrobe. The novel look is the result of different styles of weaving using beautiful colours of fabrics and imparts sparkling texture and smooth finish. Perhaps, Uppada Pattu sarees are the most loved sarees among the women of today’s era. The fashion industry is going through change day-by-day. Various innovative patterns and styles of Uppada Pattu sarees are introduced because of their wide popularity. The 9 yard sarees are traditionally woven and design to an ultimate piece. The hard work of designers and craftsmen can easily be seen in their work. The different fabrics are merged to design these beautiful sarees. The entire range is hand woven and designs are woven on both the sides. Definitely, a well made saree offers you elegance and comfort at the same time. A woman understands the needs of another woman. This is here stated because, about 40% of the weavers are women and they know what blend of colour, style and pattern looks best. The wide varieties give large options to choose from. The delightfully designed sarees are offered in countless of designs and patterns. Each piece of clothing is ornamented by the weavers so that women love to carry them. In your special occasions or festival, you can look at your best and grab the attention of all. Uppada Pattu Sarees are the celebration for Indian women. The urbane women now focus more on wearing silk sarees and what could be better than them. Something is really special about these sarees. They do not get fade and their charm still makes the women buy them. 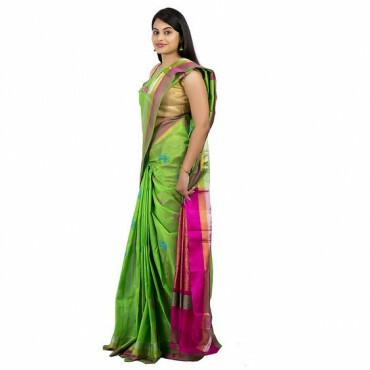 Either, it is a grand occasion or a small get together at your home; on draping the saree, you will definitely going to fetch the complements from others. The South India fabric used for the weaving sings the region’s heritage and as the time passes, these will become the most expensive sarees among all. The offered range is very light and keeps you comfortable for the whole day long. You will also be agree with the fact that modern fashion comes and go, but the trend of Uppada Pattu Sarees remains as such. Indeed, their popularity is reaching the sky day-by-day. The traditional woven sarees keep a special place in the heart and tell a tale of some brilliant craftsmanship.